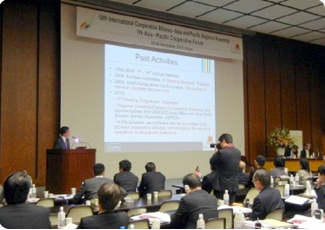 From 26-30 November 2012, the 10th ICA Asia Pacific Regional Assembly was held in Kobe. There were 204 participants from 16 countries in Asia. In the Regional Assembly, there were various committee meetings. As for National Federation of University Co-operative Associations (NFUCA) delegation, Prof. Kokichi Shoji (President of NFUCA) and Takashi Ohmoto (Executive Director of NFUCA) participated in the Consumer Co-operative Committee meeting, and a staff in charge of international affairs participated in the Youth Committee meeting. 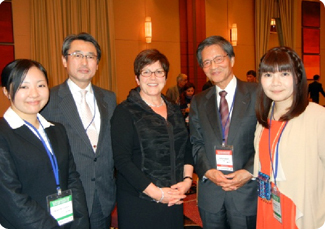 We introduced the overview and issues faced by university co-operatives in Japan. At the 7th Asia Pacific Co-op Forum that was held at the same time, Japan reported about the situation, recovery and reconstruction of Great East Japan Earthquake under the theme "Role of Co-operatives in Times of Natural Disaster." There were also reports about floods in Thailand, tsunami from Sri Lanka, tsunami from Indonesia and floods from the Philippines. The participants had a vigorous discussion about what should cooperatives do to strengthen their ability in disaster response in the community. Reports by sectoral and thematic committees took place on the final day. The Chairperson of the ICA Committee on University/Campus Co-operatives for Asia and the Pacific, Prof. Shoji, reported on past activities and future plan of the committee. The next regional assembly is going to be held in Bali, Indonesia in 2014.